The Chocolate Moose is a continuation of May’s Café, opened in 1933 by Cletus May after losing his manufacturing job during the Great Depression. Cletus and his wife, Elmsley, operated May’s Café for several years before deciding to downsize to an ice cream parlor due to the poor economy. Their eldest son, Doran, moved the parlor into the current Chocolate Moose building during the 1950’s and named it the Penguin.  After closing down temporarily, it was reopened, this time as The Chocolate Moose, in 1983, and has operated continuously ever since. After changing ownership to Doran’s son, Tim, then to Jeff Grossnickle, Justin Loveless took over ownership and operation in 2013. We take our ice cream seriously. Whether you want it in a cup, on a cone, mixed into a shake, or blended up with one of our many stir-ins, we want to make sure it exceeds your expectations. We make all of our homemade ice cream on site to ensure you consistently get the best ice cream around. If your sweet tooth is lacking, try our Ham and Cheese or BBQ Sandwich, both made from Butcher’s Block quality meats. We also offer delicious Hot Dogs, Coney Dogs, Vegetarian Burgers, and our famous Spanish Burger. While we are blessed to have many regulars, don’t be intimidated if it’s your first time. Our friendly, knowledgeable staff will be more than happy to help you find something that hits the spot.